The traveling Native North America Gathering — which celebrates the remarkable songwriting and storytelling collected on Light in the Attic's Native North America Vol. One compilation — featured an extended lineup for its Ottawa stop. In tribute to the late Willie Dunn, legendary Abenaki filmmaker Alanis Obamsawin read a touching letter to the songwriter, before gently singing three songs of her own, including "Bush Lady." 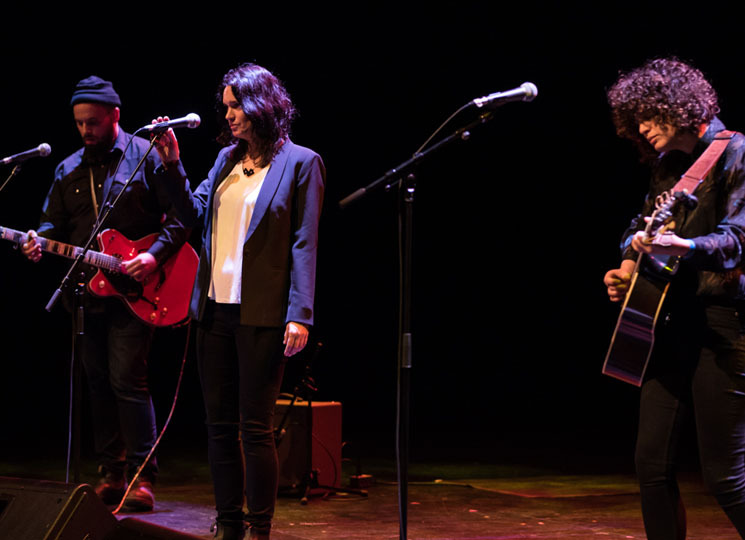 Other highlights included Leanne Betasamosake Simpson covering Dunn's poignant "I Pity the Country" with the help of songwriting sister Ansley Simpson and Nick Ferrio. With his laidback strumming and gravelly vocals, Willy Mitchell sang of the time he was shot in the head by a police officer at age 15 with "Big Police Man." Poet Duke Redbird read a series of poems that wove together cultural events in Native history and his own life, touching on his discovery of his own Indigeneity and conquering addiction. The evening took a sombre turn in the programme's back half, when host Rosanna Deerchild announced from the stage that Saskatchewan farmer Gerald Stanley had been found not guilty in the 2016 shooting death of Colten Boushie. Following a moment of silence, Deerchild noted that gatherings like this one are important to foster love and resolve through spirit and song in the face of ongoing injustice.